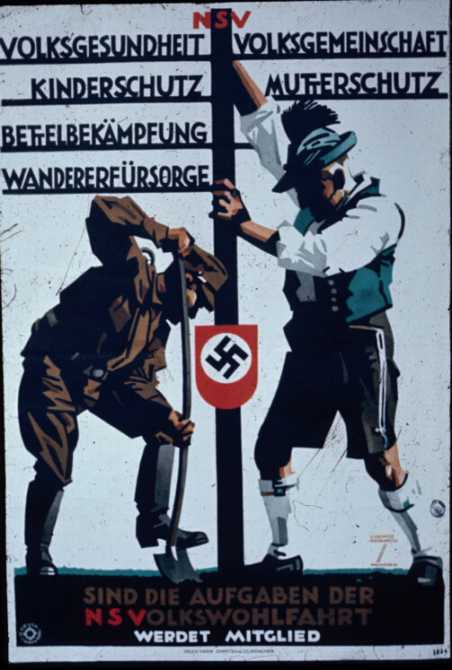 Below is a picture of an original Nazi propaganda poster ("Flaggenspruch" or "flag motto") that was often publicly displayed during World War 2. An original copy was advertised for sale on eBay in November 2005. Its basic message is that help for the poor is not charity but something which the poor have a right to -- which is of course a common Leftist claim to this day. While I think that the posters from the 1930s above are very vivid in what they tell us, it is perhaps even more impressive to see such posters "in action", as it were. And there are two photos below that show us that. The poster appearing in the photo below says something that you won't believe unless you are aware of how readily all Leftists preach one thing and do another. 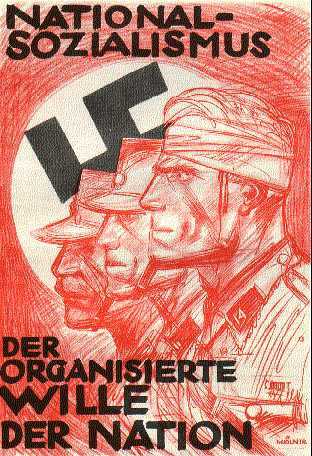 It reads "Mit Hitler gegen den Ruestungswahnsinn der Welt". And what does that mean? It means "With Hitler against the armaments madness of the world". ("Ruestung" could more precisely be translated as "military preparations" or "arms buildup" but "armaments" is a bit more idiomatic in English.) So, as we have already seen, the preaching of "peace" by the bloodthirsty Soviet regime of the cold war period had its parallel with the Nazis too. And the next poster raises some interesting issues. It translates as: "We are building up. Our building blocks are work, freedom and bread. So National Socialists, list 8". The sidetext gives satirically "the building plans of the others", with the others being the capitalists and the Communists. The building plans of the Communists (guy with big cap) translate as: "Social destruction, corruption, terror, hate and lies". Note however that "terror" (which is exactly the same word in English and German) is spelled "teppop". There is no such word in German. What the poster does is spell the "r"s in "terror" with a Cyrillic (Russian) "r", which looks like the "p" in the Latin alphabet. So the poster assumes considerable sophistication among the German people. It assumes that a satirial association between the Russians and the German Communists would be understood. It assumes a rough familiarity with the Cyrillic alphabet. The "building blocks" are also interesting. How can Nazis offer "freedom" ("Freiheit")? Presumably they would say freedom from Jewish exploitation and freedom from want. The Nazis had an extensive worker welfare program. The guy with the rolled-up sleeves is meant to represent a worker. 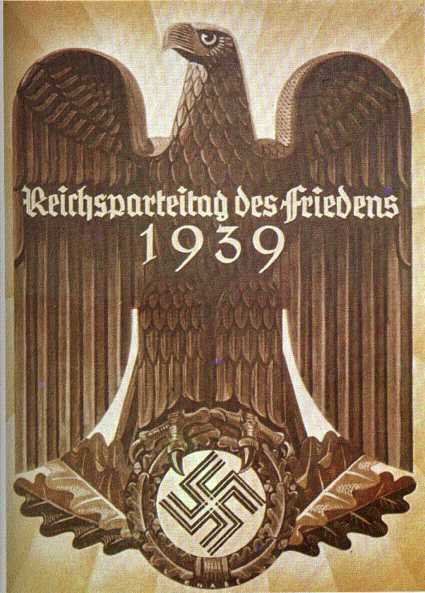 And finally, just for luck, below is a 1930's Fascist "peace" poster that does not even need translation! I guess most readers here will be aware that Britain too had a vigorous Fascist movement during the Hitler era. And the leader of the British Union of Fascists -- Sir Oswald Mosley -- was anything but a nonentity. The King even came to his wedding! And Mosley originally left the British Labour party (in 1930) because it was not socialist enough! As Mosley himself said in 1968: "I am not, and never have been, a man of the right. My position was on the Left and is now in the centre of politics"